Well hello, my fellow artists! I'm totally excited for the new (for me) possibility to share some of my artworks through DA website. A couple words about myself, I'm a professional artist from Moscow, Russia. Recently I started using Internet and got my own website, and I am taking an opportunity to enter the online artists community at DeviantART. As you can see, I prefer classic style, but not too classic ideas. Very beautiful, honed works! You have a beautiful gallery! 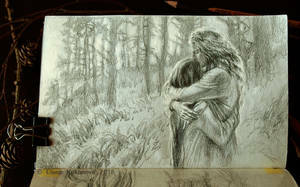 Hello, Cool your art Love lord the of rings. I want me oc girl name Dina: my hair brown and eye blue and dress Queen and my bow , i Love my boyfriends Legolas!